The leopard cat (Prionailurus bengalensis) is a small spotted wild cat (up to 106.5 cm total length; 0.5–7.1 kg) found in South and East Asia. They are solitary, living in forest, wooded areas and rural plantations. Though fairly widespread and common in other parts its range, little is known about it regionally. In Singapore, leopard cats are so rarely sighted that they were once thought to be locally extinct on the main island and likely to be at the brink of national extinction. But this did not always use to be the case. From the 1800s till 1920s, leopard cats were not uncommon in the jungles of Singapore. However, due to rapid development and forest loss after World War II, their numbers declined and the last sighting on the main island occurred in 1968. For a long time, there were no confirmed sightings until 1997, when one leopard cat was found trapped in a fishing net on Pulau Ubin. Their presence on Pulau Tekong, another off-shore island, was confirmed by an NUS researcher, Norman Lim, in 2005. On the main island, however, their occurrence were sadly only recorded from two road kills in 2001 and 2007. 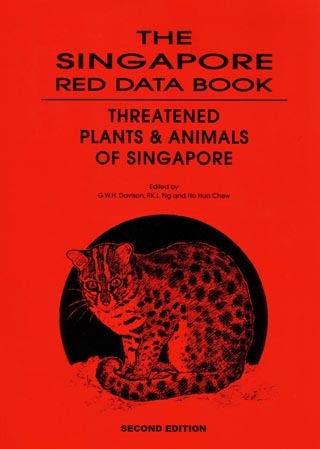 A leopard cat on the cover of the Singapore Red Data Book (second edition). Today, the leopard cat is the only native wild cat alive in Singapore and is nationally critically endangered. This project aims to find out more about the ecology of the cat where it still exists, with the hopes of ensuring its long term survival in the country. I’m very interested in the numbers of leopard cats left in Singapore. How I came across the existence of these cats in Singapore dates back to an incident in 2009. I was serving as a reconnaissance(scout) commander with 4th Singapore infantry. At about 5am I left my team mates to conduct a reconnaissance in the forested area of lim chu kang training area. Laying still, I could make out the silhouette of a mammal walking on a track approaching me. I was surprise this animal did not notice me so I kept very still as I wanted to see what it was. As it came closer, I was shocked to see a cat in this forested area. It looked me straight in the eye before bolting. Though it was dark, I could tell it was no normal domestic cat. I told my teammates much later and I was ridiculed about it. That weekend, I went back to google the possibility of wild cats in the forest of Singapore and stumbled across images of the leopard cats. These images triggered back images of the night. I’m very sure of what I saw. Hi Li Heng. Thanks for reporting this record of yours. I’m still working out the population size of the leopard cats in Singapore. It seems like they are very rare on mainland Singapore. A small population exist in the Western Catchment where you saw one, but they are doing better on Pulau Tekong. Protecting these areas will be key to their survival in Singapore. My actual field work will be coming to an end in 2 months, and will post more about the findings on the leopard cats here soon. Thanks once again for the kind word and interest in the research. Cheers. These cats are still found at Lim Chu Kang WTA. Most of the time I do see these creatures when I am on surveillance duty at WTA. Dear Sebastian, that is nice to know. I will be in touch with you for more details. Thanks! Hi Fermar, thank you! Always glad to hear from another leopard cat researcher. Do share what your thesis is about. For this post, I cited the figures (corrected) from A Field Guide to the Carnivores of the World by Luke Hunter. For the Visayan leopard cat, however, I’m not aware of any measurements except for the type specimen from Groves (1997). Otherwise, if you’re interested in Southeast Asian animals, you’ll want to look at authors such as Rabinowitz (1990), Grassman (2000, 2005). Let me know if you have difficulty accessing any of these. thanks very much for the suggestions, never been to Singapore before but this read seems very appealing. I think I will try to catch up this cat there, I think I will read all these books you suggested in order in the next 2 months. See the Stomp Seem website this morning. Someone found a dead Leopard Cat near Bukit Timah. Thanks very much Chip for the heads up. A colleague has recovered the leopard cat carcass and it is deposited in the Lee Kong Chian Natural History Museum now. That is not a known individual and we would be interested to learn more about it. I am trying to trap this cat, where can I find it? don’t worry it is a safe trap which never harm. but is it protected? Dear Jamal, why do you want to trap one? Please do not do so. 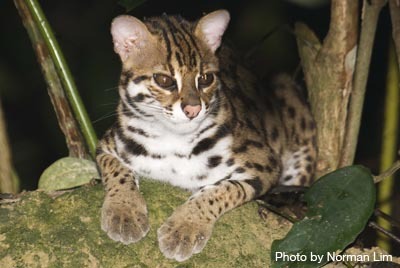 The leopard cat is a protected species in Singapore and trapping is against the law. I am a wildlife photographer from india but now live in Singapore. Is it possible to photograph the leopard cats. Appreciate any help. Dear Jayaprakash, it may be possible, but they are exceeding rare and most of them are on restricted land of the Ministry of Defence. There is a remote chance in parts of the Central Catchment Nature Reserve or Pulau Ubin. The zoo or night safari are alternatives (though that hardly counts as wildlife). I just wanna take closed up photography. In fact a singaporean is selling the leopard cat on line. it cost a thousand plus.